Prospective Info Session | Ohio Staters, Inc.
Join us Tuesday, April 9th in the Ohio Staters Office (located on the 2nd floor of the Keith B. Key Center in the Ohio Union) from 6:30-7:30pm! 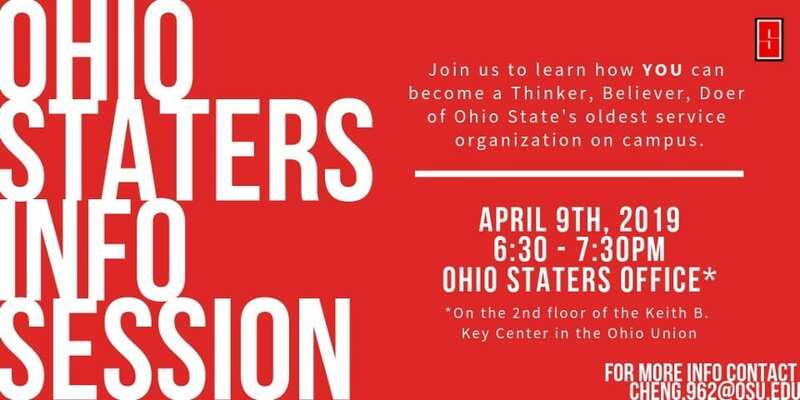 Come learn about how YOU can become a Thinker, Believer, and Doer of Ohio State’s oldest service organization on campus! Hey all you party people! Come to the Stater Office in the Ohio Union’s Keith B. Key Center this upcoming Tuesday, January 22nd at 6:30pm to meet Staters, ask questions about joining, and learn more about what exactly the oldest service organization on campus is up to right now!